The first time I heard the music of Ziad with his Trio in Rome some months ago and I was struck by something very special inside the core of it. It was only later after some chats with Ziad in Thessaloniki last week and also James (the saxophone player in the trio) that I was to learn more about the way his sounds are woven together. Ziad was raised in a family of music lovers in the city of Aleppo. There is surely no need to touch on the tragic state of affairs now in this part of the world. I had heard though that once upon a distant time, this was the city in which singers and musicians from around the Arabian world would travel long distances to in order to prove their worthiness as exponents of the art of sound. It was here where Ziad received his first lessons on Oud from his mother. From an early age he was surrounded with the secular and sacred sounds which met in the cultural crossroads of Aleppo, all deeply formative. His music is at once rich but also strikingly minimal. When presenting a maqam song („Maqam“ is a set of notes in traditional Arabic music like the scale in Western music but containing much more detailed tonal information) or building an oud (Ziad is also a highly regarded oud-maker) it is immediately apparent that he seeks to bring out the essence of the subject carefully exposing it one layer at a time. As much as possible he preserves the silences in the music and leaves only what is essential for the soul of a piece that he has played thousands of times, to come through. Maqam, says Ziad, is inherited. It can in no way be constructed from theory and therefore depends on a feeling which can only be received through direct experience. This directness is what is most apparent in his performance. As a listener what immediately strikes you in his playing is the sudden change in atmosphere in the room – something real and physical that can be felt. Naturally, as an instrumentalist, he has also forged his own path. With his own way he weds distinct elements of the two main Oud schools – namely the Arabic and Turkish systems – literally taking the right hand of one and the left hand of the other bringing them together to create something completely unique. Another feature of his playing is the way that he creates a carpet, sweeping with his right hand which he is able to pick up and carry everyone in the room giving the feeling of ‚rising up‘. I’ve often heard it claimed that in music, nothing truly new can be created any more, everything has already been done and said. But the kind of work Ziad has undertaken in the subtle fusing of these traditions, moulded by the instrumental technique, is living proof that the „new“ is continually being presented right in front of our ears. 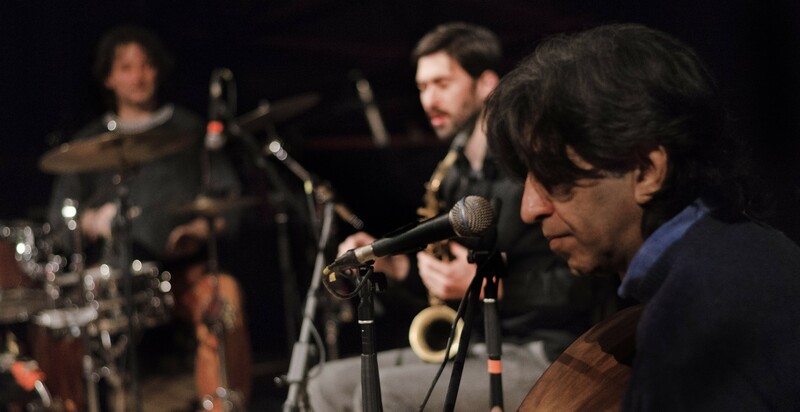 After many years of strictly solo performance Ziad has put together a new group, a trio of close friends yet very diverse musicians to continue with him. James Wylie is a wonderfully nuanced saxophonist from New Zealand who has made the move to Greece and quickly becoming an important figure on the scene. He is able to use the sax to subtly shadow the lines of Ziad and provide some beautiful textual counterpoint. Kostas Anastasiadis is in a funny way the musical antipode of Ziad. He fills the space with complex fills and shifts quickly and often between grooves on the set and the tabla. But the tension that arises from the meeting of these vastly different takes on the filling of space certainly sparks. „The heart must be transparent“ Ziad mentioned on occasion when speaking of the music. We could all take this on whichever level we feel. In his case, it is very clear where the music comes from.